The Yankees let another strong starting pitching performance get away from them on Sunday in Houston to end up with a split against the first-place Astros. Now the Yankees head to the West Coast for the final time this season to Anaheim where they always have trouble. With the Yankees and Angels meeting for the second and final time this season, Garrett Wilson of Monkey with a Halo joined me to talk about watching Mike Trout’s young MVP career and Albert Pujols trying to regain his former MVP abilities, the perception of Mike Scioscia in Anaheim and the Angels’ shaky starting rotation. The reigning AL MVP is at it again, hitting .300/.389/.575 with 19 home runs and 42 RBIs so far and making a case to be the AL MVP again. Trout is still just 23 and will be an Angel through at least 2020 and will possibly be a free agent at age 28. How fun is it watching the best player in baseball every day and how relieving is it to know he will be an Angel for at least the next five seasons after this one? It is immensely fun to watch Mike Trout play for your team. I highly recommend that every team go out and get a Mike Trout. It has been especially nice to have him this season because the roster is otherwise intensely painful to watch. Seriously, I can’t stand watching 84 percent of this roster right now, but Trout makes it worth tuning in every single night. Not only does he just consistently do amazing things, but, while he isn’t a fountain of personality, he clearly loves playing the game and that’s just fun to see in a player as good as he is. Not every superstar needs to be a brooding, over-competitive jerk or a carefully cultivated media persona, not that Yankees fans would have any idea what I am talking about with either of those examples. Keefe: On the bad side of contracts, as of now, Albert Pujols will be an Angel longer than Trout, Pujols is signed through 2021 as part of his 10-year, $240 million deal, and he’s in just his fourth year of that deal. No one expected Pujols to leave St. Louis and no one thought he would continue to be the player he was in his prime, but now that he’s been an Angel, what have you thought of his production and his renewed power this season? Were you a fan of the signing back before 2012? Wilson: Seeing Pujols recapture at least part of his former self has been more of a relief than anything. When he signed that albatross contract, everyone knew it wasn’t going to be a good deal, but there was at least the notion that he had a few more MVP-level years left in him. That didn’t happen and it was very depressing. At least this tremendous few weeks from him has given us a glimpse of the Pujols the Angels thought they were getting. Still, even if he keeps it up all season, it isn’t going to do much to make his contract any less of a bad investment. As for the signing at the time, I sort of half-approved of it. The money involved was always stupid, but I kind of believe Albert when he says that he’ll retire if his performance falls off a cliff before the contract is done. That might be a foolish belief though just because star athletes never admit their performance has deteriorated. Really though the reason I condoned it was because Arte Moreno really needed to show the world that the Angels could land a star free agent, especially after they colossally botched their pursuit of Carl Crawford and Adrian Beltre the year before. In hindsight, that seemed to backfire on the Angels because it emboldened Moreno to throw more big money after Josh Hamilton and we all know how well that turned out. Keefe: For a long time, we heard about how Mike Scioscia seemed to be the best manager in the majors and how he had the Angels in contention year in and year out despite roster turnover. 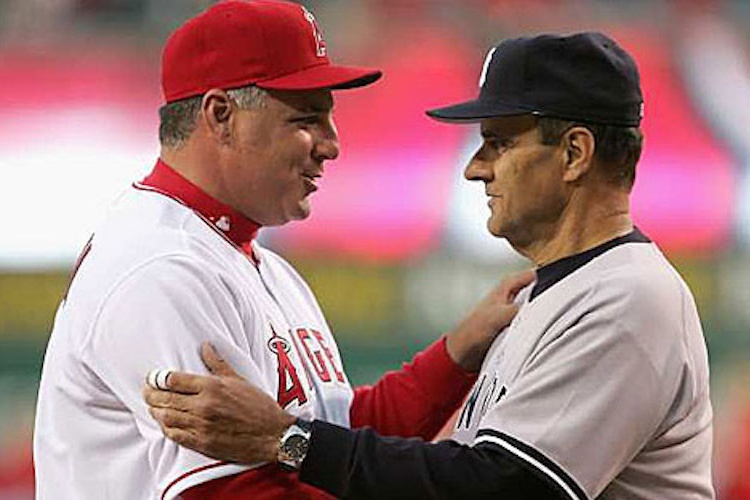 Well, after 2009, the Angel missed the playoffs for four years before returning to them last season and during that time, the Scioscia lovefest cooled considerably to the point that people believed his job was in question. Scioscia has a $50 million deal that runs through 2018 and after last season’s performance, I have to believe that he is back in Angels’ fans good graces and has his job security back (if he ever even lost it). Are you a Scioscia fan? Is he still the right man for the Angels, and did you ever want him fired? Wilson: Angels fans are in a weird place with Scioscia. I think he has worn out his welcome with a lot of the fans, but those same fans admit that there isn’t any obvious managerial upgrade out there. I am mostly a proponent of Scioscia. He’s evolved a lot of his philosophies around roster optimization and in-game tactics, but he still falls back on some pretty idiotic habits now and again. All of that is overrated though. The thing that Scioscia has always done well and that nobody ever really sees is that he controls the clubhouse. Things, for the first time I can recall, did a get a bit rocky two years ago, but other than that, he’s kept that clubhouse harmonious and kept the team focused. As for his job security, I actually think there might still be some question about it, though it comes more from his side of things. He has an opt-out in his contract after the year and I have an inkling that he might at least consider walking away if the Dodgers or Phillies come make some overtures. Not unlike with Joe Torre in New York, there just reaches a point where a club just needs a new voice. I’m not sure we’ve reached that point, but Scioscia might given how much he’s sublimated to the front office the last three years. Then again, the front office might not survive this season, so who knows. Personally, I wouldn’t be upset if Scioscia moved on assuming he is replaced by a manager who is more in tune with general manager Jerry Dipoto’s more sabermetric philosophies. Right now, it feels like both guys are kind of bending over backwards to meet the other guy halfway and it just isn’t working out. Keefe: On a team that has C.J. Wilson, Jered Weaver and Garrett Richards, it’s Hector Santiago who has the best numbers of the group. When it comes to playing the Angels, I used to fear them as a whole, but after what I saw in the three-game sweep earlier in June at Yankee Stadium, if you can hold the top of their lineup, their starting pitching is vulnerable and very beatable. Are you worried about the Angels’ rotation? Wilson: I’m not that worried about that rotation. Santiago has a great ERA right now, but he is wildly outperforming his peripherals. Wilson has actually been much better than his overall numbers, he has been mostly pretty good but has had a few horrible starts that have skewed his line. Richards is looking like an ace again and now that Heaney has been called up and Matt Shoemaker has seemingly fixed his mechanical issues, the only real concern is that Jered Weaver might be washed up. I know that doesn’t sound like a very convincing case, but you asked if I was worried, not impressed. Make no mistake, this is not a dominant rotation, but it is good enough to give the Angels a chance at winning every night. Whether or not it would hold up in the postseason is an entirely different conversation. Keefe: Last season, the Angels finished with a 98-64 record, which was the best in Major League Baseball and returned to the playoffs for the first time since 2009. However, once they got there, they were swept by the Royals in the ALDS. Coming off a 98-win season, but in an improved AL West with the Astros and Rangers being competitive once again, what are your expectations for the Angels this season? Have they changed after watching the team play for nearly one half of the season? Wilson: Perhaps it was just hubris, but coming into the season I was very confident the Angels would win the AL West with the worst-case scenario being a team that narrowly misses out on the wild card. Now, I am trying to figure out how they are only four games out of first place. Their lineup has cratered in a way that I didn’t think was possible. Trout and Pujols have been terrific and the fact that Johnny Giavotella is actually useful have been very nice, but nobody could’ve predicted that literally everyone else would have the worst offensive performance of their career to date. Freese, Aybar, Joyce, Iannetta and Calhoun have all been disappointing to varying degrees and there just isn’t much hope that they are going to be able to turn it around enough to return this offense to being the elite group it was last season. The only way to give me new hope in this team is if the Angels make a deal (probably two) to beef up the lineup.